Goodbye, Cagoule World was a melancholy trip into the heart of someone who was trying to find their place in the world. On his previous record, Benjamin Shaw tread the path of experimentation, hoping to discover the place he belonged as well as that people aren’t really terrible deep down. 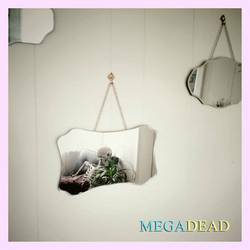 On Megadead that experimentation really comes to the fore with electronic loops brightening the journey and beats indicating movement. The narrative arc takes the form of sampled spoken words guiding you through a party you may or may not want to be at. Everybody seems to be enjoying themselves and you’re slowly moving from the outer limits of the room to try to be included – because you want to or because it’s expected – those threads are unravelled as Megadead moves forward. Shaw’s voice doesn’t take centre stage often but when it does it is in shadows, or electronically affected, and always cracked and broken. The imperfection that we heard on Goodbye, Cagoule World is still there but now it rolls in other textures with “Melanomotes” feeling like an even more morose James Blake at times. The feeling of displacement is heightened on this new record with Shaw having moved to Melbourne in recent times and recording this album in his home. Bedroom recording is a lonely experience and in his isolation Shaw finds some semblance of comfort. His songs are as much for his own loneliness as it is for those who find beauty in his work. “Push it Down” plays with synthesised lines and haunting vocal elements while Shaw sings of putting a brave smile on in the face of the unknown and uncomfortable, something everybody will have had to do in their lifetime and it’s in these personal moments that we can connect with the subject matter. Shaw is adept at bringing you into his world and emotions and on Megadead he lays those emotions bare showing us that weakness is not something to be afraid that, that it is something that is within us at all times and that it is something that is inherently human. Posted Sept. 10, 2018, 9:34 p.m.